affectionally introducing bae doo na: she hasn’t played in a movie for over two years. seems like this is the fate of a lot of my favorite actresses, think jacqueline wu qian lian – who disappeared from the movie set in the mid 90s; she made a brief return in Jiang Hu last year. 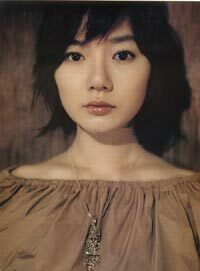 but this is about bae doo na: the first time i saw her was in one of my alltime favorite movies, Take Care of my Cat. one of a group of friends in high school, now all graduated, and trying to find their own way in life, with mixed success – she is the one who is misunderstood by her family, the illogicality of blood ties surging through (hah) her blood veins (she cuts herself out of the family picture when she decides to leave), and her noble but almost futile attempts to keep the group of friends, the camaraderie going. bravely picking up the bricks, when the house around you, life, friendships, are starting to fall apart, slowly. the start of your own life is rooted in violence, the destruction of family life – like any nation-state, its birth is intrinsically tied to cleansing – the coming-of-age. oh bae doo na, where are you? I’m anxiously awaiting that http://www.linda3.com/ movie. I’d like to re-watch Sympathy for Mr. Vengeance in the mean time, but am still a little put-off by the tendon slashing etc. Do you know doona maintains her own (photo)blog at http://blog.naver.com/hnpl46.do ? A lot of fun, there’s even some on-set photos in there. yeah, i am eagerly awaiting linda linda linda too. Have you also seen Saving My Hubby and Barking Dogs Never Bite? Two rather funny slapstick-y performances of hers. she is supercute in barking dogs! haven’t seen Saving My Hubby, nor have i seen spring with polar bear (if i remember that title correctly). any particular reason beyond interest that you are learning korean? I’m not really learning, just picking up stuff here and there. I watch a *lot* of Korean movies (have seen like 80 in the past 2 years) and it’s fun to be able to recognize the occasional sign or word. I’m more serious about learning Japanese actually, which is a little easier and of which I’ve also seen an insane amount of films. I heartily recommend Linda, Linda, Linda – Bae Doo Na is very good in the film, and the film is infectiously fun.